Funding Funding for this research was provided to Policy Analysis Inc. (PAI) by Bristol-Myers Squibb (BMS) and Pfizer Inc.
Because of the limitations of published research, this new observational study was undertaken to provide real-world evidence on the comparative effectiveness and safety of apixaban versus warfarin (with parenteral anticoagulant [PAC] bridging therapy) in the treatment of patients with VTE. To increase the power of the study to evaluate outcomes of interest, and to enhance the generalizability of study findings, four U.S. private health care claims databases—including data from unique and diverse populations—were employed in analyses. While lacking certain elements of clinical detail, such databases provide access to the health profile and health care experience (across the continuum of care settings) of tens of millions of persons over a multi-year period of time, and thus contain information on large numbers of VTE patients receiving outpatient anticoagulant therapy. This study employed a matched-cohort design and data from four large integrated U.S. private health care claims databases—the Truven Health Analytics' MarketScan Commercial Claims and Encounters and Medicare Supplemental and Coordination of Benefits Databases (the ‘MarketScan Database’); the IQVIA PharMetrics Plus Database (the ‘PharMetrics Database’); the Optum Clinformatics Claims Database (the ‘Optum Database’); and the Humana Medical, Laboratory, and Pharmacy Claims Database (the ‘Humana Database’) (ClinicalTrials.gov Identifier: NCT03521908). Patient-level data from the four databases spanned from 1 March 2014 through 30 June 2017 and were pooled for analyses. A detailed description of the study design, data sources and study methods may be found in [Supplementary Material A] (available in the online version), and operational algorithms/codes employed to define study variables may be found in [Supplementary Material B] (available in the online version). The source population included all patients aged ≥ 18 years who, between 1 September 2014 and 30 June 2017, had an encounter for the treatment of VTE. The window for identification of study subjects spans the period from the U.S. Food and Drug Administration approval date for use of apixaban in the treatment of VTE through the end of the study databases. Evidence of VTE was ascertained based on encounters in the acute-care inpatient setting or outpatient setting (e.g. emergency department, physician office) with International Classification of Diseases, Ninth/Tenth Revision, Clinical Modification (ICD-9-CM/ICD-10-CM) diagnosis codes for lower extremity DVT or PE in any position. The earliest such encounter for each patient was designated the ‘index encounter’. Outpatient encounters followed by inpatient encounters within 7 days were considered as inpatient index encounters, unless apixaban or warfarin was initiated between the outpatient encounter and inpatient encounter, in which case they were classified as outpatient index encounters. From the source population, all patients who received outpatient treatment with apixaban or warfarin (plus PAC bridging therapy) following their index encounters, and who met all other inclusion criteria, were selected as candidates for matching and thus inclusion in the study population. Outpatient use of apixaban or warfarin from the date of the index encounter (service date, if outpatient VTE; discharge date, if inpatient VTE) through the 30-day period thereafter was ascertained based on the National Drug Codes (NDCs). The first treatment (i.e. apixaban or warfarin) received by each patient was designated as the ‘index therapy’. Warfarin patients with an index VTE encounter requiring outpatient care only who did not have evidence of PAC use (i.e. bridging therapy) during the period ± 14 days from first receipt of warfarin, and those who had evidence of PAC use during this period and received it beyond the 14-day period following initiation of warfarin, were excluded. Other inclusion/exclusion criteria (e.g. ≥ 6 months of enrolment in a participating health plan prior to index encounter; no evidence of atrial fibrillation/flutter, prior VTE, history of bleeding, active malignancy) are listed in [Supplementary Material A] (available in the online version). The matching of apixaban patients to warfarin patients was implemented in two steps. First, for each apixaban patient (sorted randomly, and beginning with the first patient), all warfarin patients with exact matches on age (in years), study database (MarketScan, PharMetrics, Optum or Humana) and each characteristic of the qualifying VTE event—including care setting (inpatient vs. ambulatory), VTE diagnosis (DVT only vs. PE [with or without DVT]), VTE aetiology (provoked vs. unprovoked)—were selected as candidates for matching. Second, from the pool of candidates, the warfarin patient with the closest estimated propensity score was matched 1:1, without replacement, using the nearest-neighbour approach. Provoked VTE was defined as an event that was preceded (within 3 months) by hormone therapy, fracture/trauma involving lower extremities, pelvic/orthopaedic surgery or hospitalization for medical or surgical reasons. Propensity scores for receipt of apixaban versus warfarin—the dependent variable—were estimated using multivariable logistic regression; independent variables included age, gender, comorbidity profile, history of fall(s), history of fracture/trauma involving lower extremities, history of selected surgeries and outpatient pharmacotherapy (see [Supplementary Material A], Other Study Variables section, for a complete list of independent variables used in the estimation of propensity scores, available in the online version). 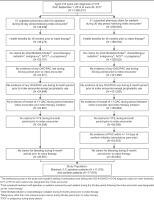 Study outcomes included major bleeding, CRNM bleeding and recurrent VTE. 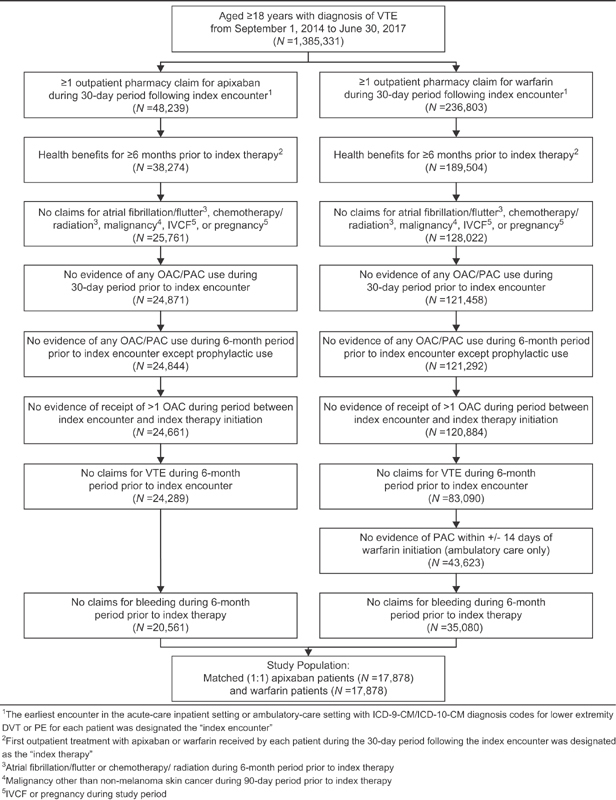 Outcomes were ascertained from the day after initiation of index therapy through the subsequent 180-day period, date of health plan disenrollment, date of death (in hospital), date of index therapy discontinuation, date of switch to another OAC, date of initiation of (new) PAC treatment or end of study database (30 June 2017), whichever occurred first. Major bleeding was defined as an acute-care inpatient admission with a principal or first-listed ICD-9-CM/ICD-10-CM diagnosis code for gastrointestinal (GI) bleeding, intra-cranial haemorrhage or other selected types/sites of bleeding, or an ICD-9-CM/ICD-10-CM procedure code for the treatment of bleeding (see [Supplementary Material A], Endpoint(s)/Outcomes(s) Assessment section, for a complete list of diagnosis codes, available in the online version). CRNM bleeding was defined as an acute-care inpatient admission with a secondary diagnosis code or an ambulatory care encounter with a diagnosis code for GI bleeding or other non-critical care types/sites of bleeding. Events that met the definitions for both major bleeding and CRNM bleeding were classified as major bleeding; CRNM bleeding events that followed major bleeding events were not considered in analyses of CRNM bleeding. Recurrent VTE was defined as a subsequent acute-care inpatient admission with a corresponding principal/first-listed diagnosis; admissions occurring within 7 days of the index VTE encounter—irrespective of care setting—were not considered as recurrent events. The adequacy of the matching procedure in terms of patients' baseline characteristics was evaluated using standardized differences; a value of < 0.1 was assumed to indicate a negligible difference in the characteristic between apixaban patients and warfarin patients. Major bleeding, CRNM bleeding and recurrent VTE were compared between patients who received apixaban versus warfarin using shared frailty models (an extension of the Cox proportional hazards model that adjusts for correlation from matching). The Kaplan–Meier method was used to generate the cumulative incidence of major bleeding, CRNM bleeding and recurrent VTE, during the follow-up period and statistical comparisons were based on the stratified log-rank test. The proportional hazards assumption was evaluated using published methods. Based on a priori assumptions regarding sample size and risks of major bleeding, CRNM bleeding and recurrent VTE, analyses were adequately powered to evaluate study objectives; a description of power calculations may be found in [Supplementary Material A], Power/Sample Size section (available in the online version). The sensitivity of study results to alternative methods for confounding adjustment (i.e. using all patients and the inverse probability treatment weighting method and multivariable Cox proportional hazards models, respectively), and the variability of study results when using data from each of the four health care claims repositories separately, were evaluated. Methods for these analyses are set forth in [Supplementary Material A] (available in the online version). Approximately 1.4 million adult patients had a diagnosis of VTE between September 2014 and June 2017, of whom 285,042 (21%) had ≥ 1 filled prescription for apixaban (n = 48,239) or warfarin (n = 236,803) during the 30-day period following their index VTE encounter ([Fig. 1]). Among this sub-group, 17,878 (87%) of the 20,561 apixaban patients who met all remaining selection criteria were matched (1:1) to warfarin patients, and all matched patients were included in the study population. A detailed description of patients meeting inclusion/exclusion criteria may be found in [Supplementary Material C] (available in the online version). Fig. 1 Selection of patients receiving apixaban or warfarin as outpatient therapy for VTE. IVCF, inferior vena cava filter; OAC, oral anticoagulant; PAC, parenteral anticoagulant; VTE, venous thromboembolism. Mean (standard deviation [SD]) age of matched apixaban and warfarin patients was 60 (16) years, 37% of both treatment groups were aged ≥ 65 years and 52% of apixaban and warfarin patients were male; comorbidity profiles, history of procedures and use of outpatient pharmacotherapy were also comparable ([Table 1]). Fifty-four per cent of apixaban and warfarin patients were hospitalized for their index VTE encounter, 41% had PE (with or without DVT) and 23% had provoked VTE. Mean time from index VTE encounter to initial dispense of index therapy was 6.9 days for apixaban patients and 3.7 days for warfarin patients. Abbreviations: ACE inhibitors, angiotensin-converting enzyme inhibitors; AIDS, acquired immune deficiency syndrome; ARBs, angiotensin receptor blockers; COPD, chronic obstructive pulmonary disease; DVT, deep vein thrombosis; NSAID, non-steroidal anti-inflammatory drug; PE, pulmonary embolism; SD, standard deviation; SERM, selective estrogen receptor modulator; TIA, transient ischaemic attack; VTE, venous thromboembolism. During a mean (SD) follow-up of 143 (57) days, apixaban patients filled 4.2 (2.9) outpatient prescriptions covering 116 (61) therapy days ([Supplementary Material C], available in the online version); 93% of initial prescriptions and 91% of subsequent prescriptions were for the 5 mg tablet. For warfarin patients during an average follow-up of 152 (52) days, numbers of filled outpatient prescriptions and therapy days were 5.1 (4.2) and 136 (71). Less than 5% of patients in each treatment group switched from their index therapy to another OAC during follow-up. Outpatient use of PAC between the index encounter and initiation of index therapy was recorded among 59% of warfarin patients and 2% of apixaban patients; PAC use subsequent to initiation of index therapy was 63% and 3%, respectively. Incidence proportion for major bleeding was 1.7% (4.2 per 100 patient-years) among apixaban patients versus 2.3% (5.5 per 100 patient-years) among warfarin patients, while corresponding figures for CRNM bleeding were 7.0% (18.0 per 100 patient-years) and 9.4% (22.7 per 100 patient-years) ([Table 2], [Fig. 2]). The hazard ratio (HR) for major bleeding was 0.75 (95% confidence interval [CI] = 0.64–0.87) for apixaban versus warfarin, while the HR for CRNM bleeding was 0.77 (95% CI = 0.71–0.83). Fig. 2 Cumulative incidence of major bleeding, CRNM bleeding and recurrent VTE among patients receiving apixaban and warfarin as outpatient therapy for VTE. CRNM, clinically relevant non-major; VTE, venous thromboembolism. Abbreviations: CI, confidence interval; CRNM, clinically relevant non-major; HR, hazard ratio; PY, patient-years; VTE, venous thromboembolism. Incidence proportion for recurrent VTE was 2.3% (5.8 per 100 patient-years) for those receiving apixaban versus 2.9% (7.0 per 100 patient-years) for those receiving warfarin; the HR was 0.80 (95% CI = 0.70–0.91). Results from analyses based on each of the four databases separately ([Fig. 3]), and those from sensitivity analyses employing alternative methods for confounding adjustment ([Fig. 4], [Supplementary Material C], available in the online version), were largely similar. Fig. 3 Hazard ratios for bleeding events and recurrent VTE among patients receiving apixaban and warfarin as outpatient therapy for VTE, overall and by study database. CI, confidence interval; CRNM, clinically relevant non-major; VTE, venous thromboembolism. Fig. 4 Hazard ratios for bleeding events and recurrent VTE among patients receiving apixaban and warfarin as outpatient therapy for VTE, based on alternative approaches for confounding adjustment. CI, confidence interval; CRNM, clinically relevant non-major; IPTW-ATE, inverse probability of treatment weighting-average treatment effect; PH, proportional hazard; VTE, venous thromboembolism. This evaluation is, to the best of our knowledge, the first one to compare the effectiveness and safety of apixaban versus warfarin for the treatment of VTE in a real-world population. Our findings are based on data for nearly 36,000 patients from four large databases—including information from unique and diverse populations—and are generally robust in sensitivity analyses when using each database separately. The conclusions that may be drawn from our findings are generally consistent with, and supplement those from, the pivotal Phase III clinical trial of apixaban versus conventional therapy (i.e. enoxaparin followed by warfarin) in the treatment of VTE (AMPLIFY). In AMPLIFY, like our study, risks of major bleeding (0.6% vs. 1.8%; relative risk = 0.31 [0.17–0.55], p < 0.001) and CRNM bleeding (3.8% vs. 8.0%; relative risk = 0.48 [0.38–0.60], p < 0.001) during the 180-day follow-up period were significantly lower with apixaban versus conventional therapy. Apixaban also was found to be non-inferior to conventional therapy in terms of risk of recurrent VTE or VTE-related death during the 180-day follow-up period: 2.3% versus 2.7% (relative risk = 0.84 [0.60–1.18], p < 0.001 for non-inferiority). We note that results from our evaluation and AMPLIFY were found to be comparable despite differences in study designs, study populations and study methods, and that real-world studies are subject to the vagaries of clinical practice (e.g. treatment selection and patterns, drug compliance). For example, at baseline, our study population was slightly older (60 vs. 57 years), had a higher percentage of patients with PE (41% vs. 34%) and had a higher percentage of patients with provoked VTE (23% vs. 10%). We also note that such differences may be attributable—at least in part—to imprecision in the algorithms employed to characterize the population in our study. Our study, although large with nearly 36,000 patients, is still subject to the inherent limitations of evaluations using health care claims data. 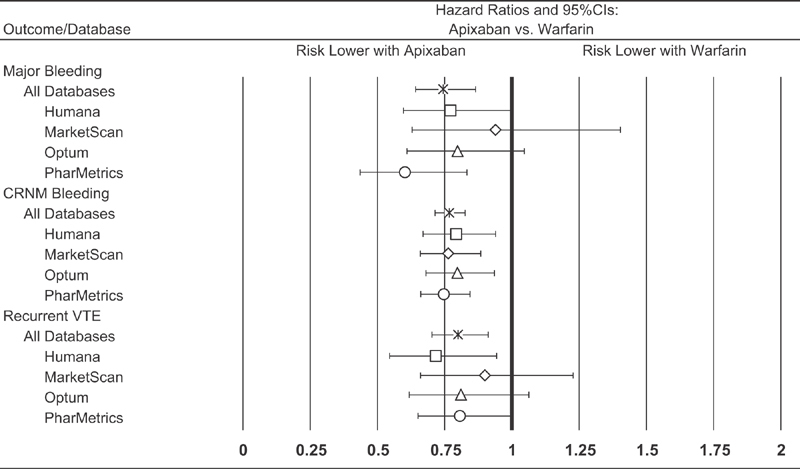 In clinical practice, patients who receive apixaban may be systematically different than those who receive warfarin with bridging therapy, and to the extent that such differences are unobserved, study results may be biased. Other unmeasurable factors including differences in physician-level, practice-level and plan-level characteristics may also confound the results of both medication exposure (apixaban vs. warfarin) and outcomes (bleeding events, recurrent VTE events). Additionally, data on inpatient drug utilization are not available in the study databases, and thus it is not possible to fully characterize the initial management of VTE requiring inpatient care. While a matched-cohort design has certain advantages (e.g. covariate balance), one of the main disadvantages is the loss of sample/information. Accordingly, sensitivity analyses for each outcome were conducted using data on all patients and the inverse probability of treatment weighting method and multivariable Cox proportional hazards models, respectively. The results from these analyses were similar to those yielded by the matched-cohort design. Our study used definitions for major bleeding, CRNM bleeding and recurrent VTE that have not been formally validated and cannot be objectively confirmed within the scope of this study, and thus their accuracy is unknown. However, the definition for major bleeding was based in large part on validated claims-based algorithms and the International Society on Thrombosis and Haemostasis' (ISTH) definition that was used in a large clinical trial, and our definition for major bleeding has been employed in previously published studies. Also, our definition for recurrent VTE is similar to ones used in prior evaluations. Because, to the best of our knowledge, there are no recommendations or guidelines for defining CRNM bleeding in real-world studies, we defined CRNM bleeding as events that did not qualify as major bleeding and that did not involve ISTH-defined critical care sites. Although the health plans contributing claims and enrolment information to the four databases are different, the possibility exists that a patient may be insured by multiple plans at the same time and thus be included in more than one database during the same period. The extent of such overlap is, however, believed to be low. The possibility also exists that a patient who changed residence or left one health plan to join another could be represented multiple times in the study databases, although over different periods. While information on drug dose and drug supply is available from outpatient pharmacy claims, we cannot determine from such data if dispensed drug was actually taken, when it was taken or how much was taken. Because the study data sources do not include complete mortality information, death was not treated as a competing risk, which may inflate estimated risks of the outcomes of interest. We suspect, however, that the percentage of patients who died during follow-up is low (i.e. < 10%) based on the observed mortality rate in the AMPLIFY trial, and thus that any such bias does not disproportionately impact in a material fashion one treatment group versus the other. Because the accuracy of algorithms/variables capturing the presence of acute and chronic conditions is undoubtedly less than perfect, because results from exams (e.g. blood pressure) and laboratories (e.g. serum creatinine, blood glucose, liver enzymes) are not available in the data sources, and because histories are left-truncated, some patients may be misclassified in terms of their comorbidity profile and/or pre-index health care experience. The study population comprised patients with medical and drug benefits from private U.S. health plans, and thus the study population may not reflect patients treated in clinical practice across the United States. Consequently, study results may not be generalizable to those with public health insurance, the uninsured or other segments of the U.S. population. Finally, because of the challenges establishing causality in evaluations such as ours, caution should be exercised in interpreting the results of this evaluation and additional research based on data from other real-world settings is needed to validate these findings. In this large-scale evaluation of VTE patients receiving outpatient treatment with apixaban or warfarin in U.S. clinical practice, risks of major bleeding, CRNM bleeding and recurrent VTE were found to be significantly lower among patients who received apixaban. These results, which were largely comparable with, and supplement those from, the pivotal clinical trial AMPLIFY, provide the first evidence regarding the effectiveness and safety of apixaban for the treatment of VTE in real-world settings. Additional research based on data from other real-world settings would be helpful in validating these findings. Warfarin has long been standard of care for VTE, despite increased risk of bleeding. In recent clinical trial (AMPLIFY), apixaban was non-inferior to enoxaparin/warfarin in treatment of VTE and had significantly lower risk of major bleeding. Evidence of drug efficacy and safety from clinical trials may not, however, be reflective of their effectiveness and safety in clinical practice. This large-scale evaluation provides first evidence on effectiveness and safety of apixaban versus warfarin (plus bridge therapy) in a real-world VTE population. Risks of major bleeding, non-major bleeding and recurrent VTE were lower among patients receiving apixaban, consistent with results from AMPLIFY. M.A., A.H. and D.W. are employed by PAI. X.L., G.D.W., M.H., L.V., X.P. and L.B. are employed by, and own stock in, BMS. T.L., X.L. and J.M. are employed by, and own stock in, Pfizer Inc. A.T.C. receives consultancies and honoraria from BMS and Pfizer, Bayer, Daiichi Sankyo, Boehringer Ingelheim and Portola, as well as other companies.